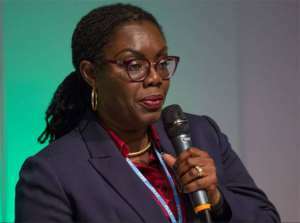 Communications Minister, Ursula Owusu-Ekuful, has called for stronger ties among the 63 member states of the Budapest Convention on Cybercrime. According to the Minister, each of the 63 states need to identify their unique role and obligations to ensure the effective implementation of the Convention. Failure to cooperate effectively, she said, will mean that the various states risk sinking together. The Minister made the call on Monday, March 18, in Accra at a conference on the technical implementation of the Budapest Convention on Cybercrime. The workshop was organized by the Council of Europe in partnership with the Ministry of Communications. She stressed that the implementation of the Convention was a collective responsibility. Fake news is spreading like wildfire on social media platforms, constituting a real and present security threat. These are only some of the more common cyber threats we are exposed to but there are others. Mrs. Owusu-Ekuful lamented that lack of effective cooperation at the domestic level has impacted on member states' ability to fight cybercrime. “I have been informed that most operators do not comply with some of these legal obligations. She added that “the police CID did not receive a response from either the Head of Legal or any other senior official but got a dismissive note from an Administrative Assistant stating the non-availability of the requested information. She announced that the Ministry of Communications was working on a draft cyber-security legislation which will address some identified weaknesses in Ghana's cybercrime laws and make provisions for appropriate sanctions for non-compliance with our cyber-security provisions. In addition, she said, the Council of Europe has assessed our current cybercrime legislation and identified some gaps which we need to fill in order to achieve compliance with the Convention. In 2018, Ghana acceded to the Convention on Cybercrime as the 62nd state party to have signed the Budapest Convention which is so far the only globally recognized treaty on Cybercrime. It became the 5th country on the African continent to have acceded to the Convention, after Mauritius, Senegal, Cape Verde and Morocco. Mrs. Owusu-Ekuful said Parliament shall ratify the Budapest Convention hopefully in April this year. said in 2018, a million new internet users came online everyday.